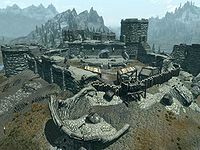 Greymoor, also called Black Moor or Darkmoor,[nb 1] is a settlement located in the tundra of Whiterun Hold, immediately west of the Skyrim city of Whiterun. Fort Greymoor guards the strategic crossroad which connects Whiterun with the Reach, Hjaalmarch, and Haafingar. In the early years of the Third Era, Darkmoor was ruled by Count Sven Advensen and his wife. Emperor Tiber Septim granted Sven this title and fiefdom upon his retirement from the Imperial Legion. The previous rulers there had been distant cousins to the new Count and his wife, Lady Inga. The couple famously became the guardians of Princess Barenziah, and the future Queen of Morrowind was raised in the small Skyrim village, unaware of her birthright. During the Imperial Simulacrum in the late Third Era, the village of Black Moor was an active settlement, being ruled by Lord Torben. It had a rivalry with North Keep. By 4E 201, the ruins of Fort Greymoor had been ravaged by war, and collapsed parts of the stone walls were fortified with wooden barricades. The occupants changed regularly, with Orcs, vampires and bandits all having occupied the ruins. During the Stormcloak Rebellion, the fort served as a point of contention between the Imperial Legion and the Stormcloaks, with both sides struggling for control. 1. In TES: Arena, "Black Moor" was also sometimes spelled Blackmoor, Darkmoor, or Greymoor. Some references in the Skyrim data files call the location Fort Blackmoor. The Real Barenziah also describes the fort as "Darkmoor Keep". For game-specific information, see the Arena and Skyrim articles. This page was last modified on 20 January 2019, at 14:35.